On the week of July 8th Africa was marked by several important attacks and developments. In Nigeria, nearly one hundred people reportedly died in large-scale attacks launched by Middle Belt, Fulani militiamen in Adamawa and Tabara states over July 9-10th. 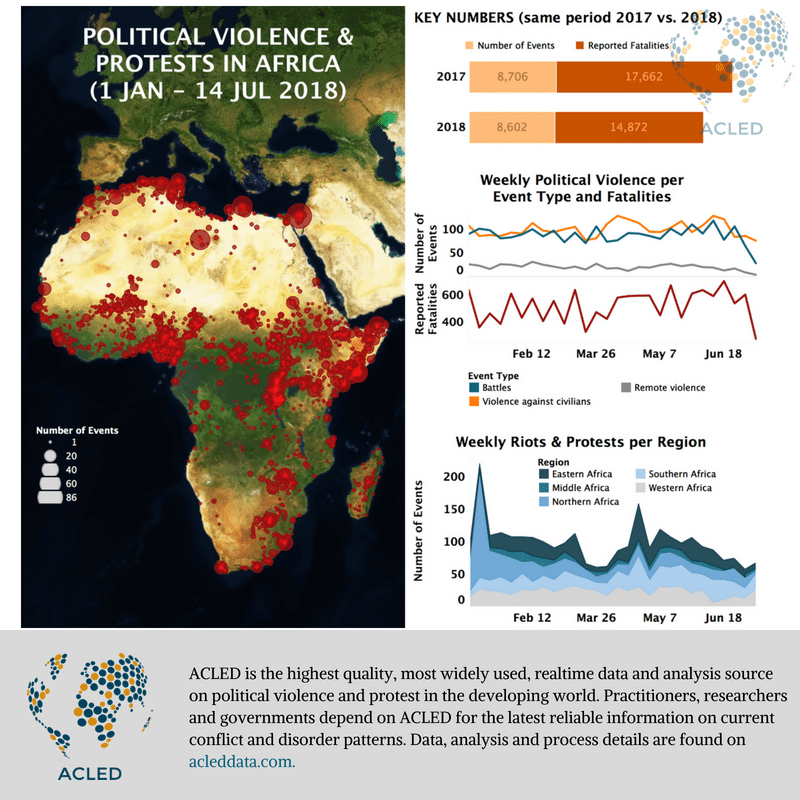 Recent raids by the various Fulani militants have been increasingly violent and spread out, suggesting many groups are active. Unknown militants also attacked several villages in Sokoto on the same days, leaving an additional 26 people reportedly killed. Meanwhile, tensions rose in Ekiti state from July 8th as supporters of the ruling All Progressives Congress (APC) tried to intimidate the opposition Peoples Democratic Party (PDP) in the run up to the governorship elections. APC-backed security operatives allegedly brutalized the PDP governor after occupying his office, while police arrested his staff, including his chief of staff, and “thugs” smashed and stole election boxes on election day on July 15th. Government representatives were targeted by insurgents in Tunisia, Cameroon and Somalia. In Tunisia, Okba Ibn Nafaa Brigade militants carried out a complex ambush against a National Border Guards’ convoy on July 8th in the area of Ain Soltane, Jendouba governorate, close to the border with Algeria. The attack was initiated by an IED detonation followed by enfilading gunfire. Six national guards were reportedly killed and three others wounded – the deadliest assault since the events of Ben Guerdane in March 2016. Following the attack, large combing operations were launched in the area by the Tunisian forces, as well as by Algerian troops on their side of the border. In Cameroon, suspected Ambazonian separatists ambushed the convoy of the Minister of Defense in Small Ekombe on July 12th, during an official trip to the Sud-Ouest region. The separatists were quickly overpowered in the ensuing battle. In Somalia, Al Shabaab launched a large, complex attack on the interior and security ministries in the capital, Mogadishu, on July 7th. Following two large vehicle-borne suicide explosions, several militants attempted to enter the buildings, but they were repelled by the security forces. The attack left at least 15 reported fatalities and dozens of injuries. In South Sudan, raiders from the Murle ethnic group attacked members of the Jieh ethnic group in Boma state, Jonglei. The ensuing clashes, in which military generals were suspected to have also been involved, left an alleged 86 people killed across both sides, over 20 injured and 42,000 heads of cattle stolen. This is the first reported incident involving Murle militiamen in months. By contrast, the first half of 2017 had been marked by some of the highest levels of activity by the group. On the insurgency front, clashes continued between the military and Sudanese Peoples Liberation Army/Movement-In Opposition (SPLA-IO) forces in Kajo-Keji and Morobo counties of Central Equatoria, close to the tri-border area with Uganda and the Democratic Republic of Congo (DRC). Fighting is expected to continue as the SPLA-IO rejected the power-sharing agreement reached in Entebbe in early July, and condemned the South Sudanese Parliament’s passing of a constitutional amendment that extends the government’s mandate for a further three years – a move also roundly condemned by the Troika nations. Further south, violence resumed in Mozambique’s Cabo Delgado province after nearly two weeks of relative calm. On July 7th, a suspected Ahlu Sunna Wal Jamaa militant cell attacked Mbau in Mocimboa da Praia, allegedly beheading four people. Similar attacks on civilians by unknown assailants were reported on that day in Quiterajo and Macanga in the Macomia and Palma districts, respectively. Clashes between unknown assailants and security forces also occurred three days later in Quissungule near Namoto in Balama district. This is the first time that Balama is affected by the growing violence in Cabo Delgado. A pattern of violence against civilians by uncoordinated militant cells has emerged in Cabo Delgado since the end of 2017 but the cells’ lack of clear leadership and articulated goals have been constraining the government’s response to the situation. Finally, Durban in South Africa went on high alert last week as several bombs were discovered placed around the city, targeting malls and grocery shops. No group has yet claimed responsibility. This coupled with other recent unusual developments such as the attacks on two mosques in Durban and Western Cape, are raising fears over the dangers of extremism in the country.